Here at the Rockin’ R Ranch, your stomach, as they say in the Old West, will never think your throat’s been cut! 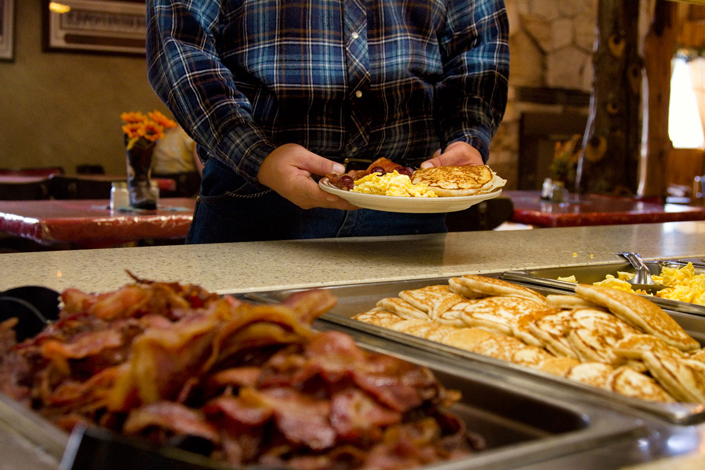 Whether you belly up to a great buffet-style breakfast, or sit down to dinner and have one of our kitchen hands bring you a plate piled high with a hearty helping of some of the best home-style cookin’ around, our meals will entice and satisfy you. So, sit back, take a load off, and reminisce with your family and friends about the day’s exciting events. With a Salad Bar and Dessert included, we have everything covered. If you have special dietary needs, please ask us about options when you contact us. And remember, there is no shame in having to undo a couple of notches on your belt buckle! Make sure to stop by The Ol’ Ice Cream Parlor, too: we offer a variety of delicious flavors with generous scoops atop old-fashioned cones.